On a recent road trip with my family, we were quick to notice that there were several busy recreation centers in every town. With the lake shore so near, my family couldn&apos;t quite understand why so many were gathered to play mini-golf. They forget that not everyone has a recreation center close to home. In Hendricks County, Just 4 Fun Recreation Center -- tucked just off of U.S. 40 at 3650 Clarks Creek Road in Plainfield -- has all the amenities of its&apos; shoreline counterparts. A few weeks before our trip, we were looking for something to do with our boys while our daughter was at a friend&apos;s house. We decided it was a perfect night to spend at Just 4 Fun. Our agenda included: a few trips around the go-kart track, several swings in the batting cages and a free-throw competition in the arcade room. Our youngest is 11 now, so he was super excited to drive the go-karts. A more prepared parent would have visited their website to ensure the boy could in fact drive them. Prepared I was not. Here are some more details about the recreation center to help you be better prepared than me. Just 4 Fun offers two go-kart options - a slick track and a road course. Both require that drivers be at least 58-inches tall. Drivers that are 16 or older may have a passenger on the road course - passenger must be at least 3-years-old and under 58-inches tall. For the slick track, drivers must meet the height requirement, be at least 15 1/2-years-old and have a valid learner&apos;s permit or driver&apos;s license. The cost for either track is $6. Passengers are free. Click here for pricing information and package deals. So the young one didn&apos;t meet the height requirement. Poor kid, it&apos;s hard being short. He opted to spend more time in the batting cages. Beginners and all-stars alike will find a cage that suits them. They offer cages with baseball pitch speeds of 80, 70 and 45 mph. Batters also have the option of a 60 mph softball pitch or three slow pitch softball cages. Batting cages are paid with tokens: 1 token is $1, 6 tokens for $5 or you can get 13 tokens for $10. Cages can also be rented for $25 an hour, but must be reserved 24 hours in advance. Bats and helmets are provided or you can bring your own gear. Summer evenings in Indiana can be pretty awesome and a round of miniature gold can be a great way to enjoy it with your family or on a date night. Just 4 Fun&apos;s 18-hole course offers a peaceful, yet exciting setting that will be enjoyed by golfers of all ages. Guests will be challenged by the course and captivated by the waterfalls, ponds, brightly colored landscape and twinkling lights. The course is stroller and wheelchair accessible. Pricing for a round: adults - $6, senior citizens and children (ages 6-12) - $5, children 5-years-old and younger are free with paying adult (two children per paying adult), additional children are $1. Click here for pricing and special package offers. Tickets for a round of mini golf are sold up until an hour before closing. Outdoor attractions at Just 4 Fun are weather permitting and the center suggests calling ahead if the forecast is questionable. My boys were ready to make their way into the air-conditioned game room after an hour in the batting cages. This 4,000-square-foot game room is home to a variety of games, as well as a party area. It&apos;s the typical token-pay style arcade, with games that give tickets that can be turned in for prizes. What I like about it is that there is plenty of games to choose from, but the room is not overcrowded or overwhelming. My family favors the basketball shootout game and classic skeeball. 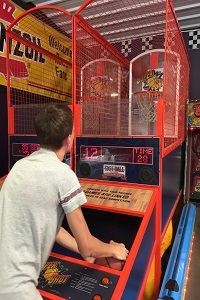 Our oldest beat his dad multiple times at the free-throw game and raked in a wealth of tickets. He&apos;s too cool for the prize counter, so our too-short-to-go-kart boy left with a pocket full of prize candy. Everyone was happy. With school back in session for most, operation hours have changed. They are closed for business Monday-Thursday. Just 4 Fun is now open on Fridays from 4-11 p.m., Saturdays from noon-11 p.m., and Sundays from noon-9 p.m.
Just 4 Fun is also a great place to host company outings or birthday parties. Click here to learn more about birthday party packages. Call (317) 838-4386 for more information about company outings and group rates. Both indoor and outdoor attractions are open from Spring until late Fall. 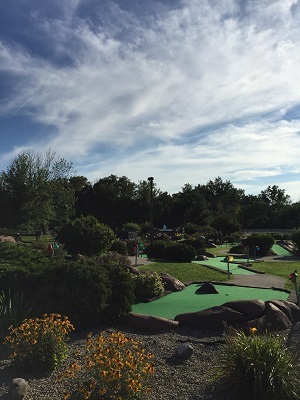 If you&apos;re looking for a few hours of fun with the family, a date-night activity, or a place to hold you&apos;re next party, Just 4 Fun in Plainfield has plenty to offer guests of all ages.